“An excellent book to read at this time during the anniversary of the bombing of the German dams by what seemed impossible odds.” Review. This short introduction to Guy Gibson and the Dambusters raid is the first chapter of British Flying Legends, a new book by Richard Edwards, and is around the length of a short story, approximately 30 printed pages. 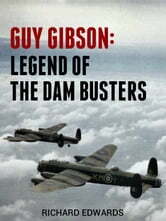 Guy Gibson: Legend of the Dam Busters is a concise account of Bomber Command’s most accomplished aviator and their most famous raid of the Second World War. It gives the reader an immediate and straightforward insight into the life and personality of Guy Gibson and is aimed at people who are looking for an uncomplicated account of a significant part of British wartime history. Other more in-depth titles are available for people who are looking for definitive or academic reading and you should consider those first if that’s what you’re looking for. 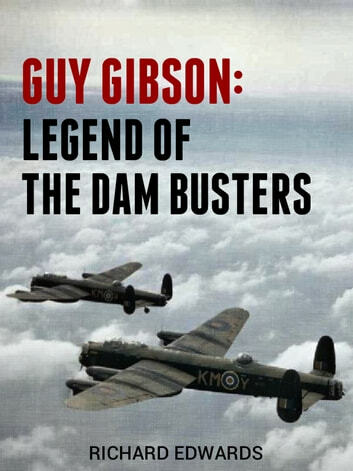 In addition to exploring the Dambusters raid this book looks at Gibson’s childhood, his RAF career and the development of the bouncing bomb, including the intense wrangling within the RAF that almost stopped it from getting off the drawing board. It also reveals the truth behind the mysterious air crash that one year later cost Gibson and his navigator, Jim Warwick, their lives and why the RAF chose to keep the cause of the crash a secret. Each further chapter of British Flying Legends will examine the life and achievements of a different aviation legend from the twentieth-century. Richard will release each chapter individually, as well as in a single volume, allowing the reader to either pick and choose the topics that they are interested in or to read the whole set. To find out more about the British Flying Legends series visit Richard’s website and blog at richardedwards.info. Richard Edwards lives in Sussex and writes both fiction and non-fiction, with a particular interest in military history, biography and adventure. He has published The Rise and Fall of the Japanese Imperial Naval Air Service and Heroes and Landmarks of British Aviation, which are available in hardback and ebook through Pen and Sword Aviation. For more information visit http://richardedwards.info. Very short read but interesting never the less. An amazing historical account of outstanding courage and dedication that too few people have or use in time of crisis . Guy Gibson should have an National British holiday in His name honoring His service,s and outstanding courage. Good informative short read for any world war 2 aviation enthusiasts.